Panaji Sep 14 (IANS) Ailing Goa Chief Minister Manohar Parrikar on Friday evening left a private hospital where he was admitted for the last two days to attend Ganesh Chaturthi celebrations at his ancestral home in Parra village located about 10 km from Panaji. Parrikar who is being treated for advanced pancreatic cancer surprised waiting journalists by walking out of the clinic in Candolim beach village wearing a non-customary full-sleeved white shirt and stepping into the front seat of a waiting car which drove straight to his ancestral residence where other members of his family were awaiting him. Sources said he is expected to head back to the clinic after paying his respects to the Ganesh idol at his ancestral residence. 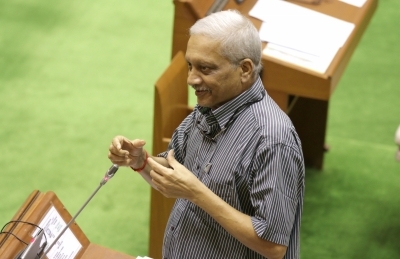 Parrikar s emergence from the clinic came minutes after a core committee meeting of the state Bharatiya Janata Party (BJP) leaders got underway here to deliberate on the prevailing political situation in Goa with the Chief Minister hospitalised for several days now. The 62-year-old former Defence Minister who had been resting at his private residence near Panaji ever since his return from the US on September 6 was admitted to this very clinic operated by a relative last week before being admitted a second time two days back after sources said he had developed fever. The Chief Minister earlier this month returned from the US -- for the third time in six months -- where he was undergoing treatment for this ailment. He has not attended office since his return from New York inviting criticism from the Opposition as well as the civil society.